You are the greatest thing ever invented. When I first saw you, clustered in a window display of a home furnishings store in the sketchiest part of Barrie, I knew you were special. The sunlight reflected off of your bright white sheen, almost blinding me. How could I not go inside and check you out? Three minutes later, you officially became a part of my life. Pouring milk into my morning tea has never been cute-r or fun-ner. There are some out there who don't know how friggin' amazing you are, so let's get you all introduced. This is what a Gurgle Pot looks like. They're originally from France but now there's a North American distributor. My lovely Pot is white, like the one above but they come in a rainbow of colour options. 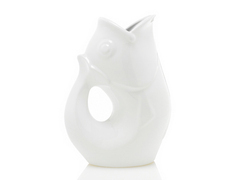 What makes this Pot WAY better than just an "ordinary fish jug" though...is the gurgling. Every time I pour a little milk out, you makes the best sounds and the giggling-gurgles never fail to put a smile on my face. You've now become my standard wedding present for those who I love most (if you haven't gotten one, I guess you didn't make the cut...haha!! I kid, I kid). There were EXTREME logistical issues in ordering one for my gal pal who thew the Best Wedding Ever in the summer, but she FINALLY received hers yesterday. So thank you, wondrous Gurgle Pot, for making my mornings WAY BETTER!! I'm obsessed with this, thanks, and MUST HAVE ONE.